At the base of Twin Peaks, ~165'. 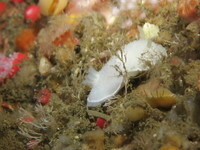 Anyone want to check it out on the Summer Adventures Program post-collection fun dive this Wed, July 29? Let me know! Upwelling-conducive SW winds between now and then. Could be epic out there! Already intimations of epic today. Are they Boris, Eric & Aaron?